In the following a typical anchor handling operation will be described step by sted. The procedure described is just one out of many more or less different ways of retreiving an oil rig mooring anchor from the seabed. The oil rig's equipment and / or construction may dictate a different procedure, as may the anchor handling vessel, but the procedure described here is the one I have participated in the most. If the anchor has been deployed correctly when the rig moorings were laid out and if the anchor has been lifted off the seabed correctly it should face the correct way when reaching the vessel's stern roller. The A-guides are opened and the anchor and the connected chain are pulled onto the deck. When the anchor has passed the guides, these will be closed around the anchor chain. Also the the shark jaws will be closed around the chain and then the work wire can be slacked off and work on the anchor initiated. If the anchor is not facing the right way on the stern roller it usually helps to lower it a bit and maybe give it a short burst of propeller thrust. If the anchor can't be brought to face the right way you can still just heave it on board, but working with the anchor (disconnecting chain and equipment etc.) will be a little more difficult. The best way of pulling the anchor on deck is with the anchor, as shown, laying on it's back with the anchor chain going atop of the anchor between the two legs. 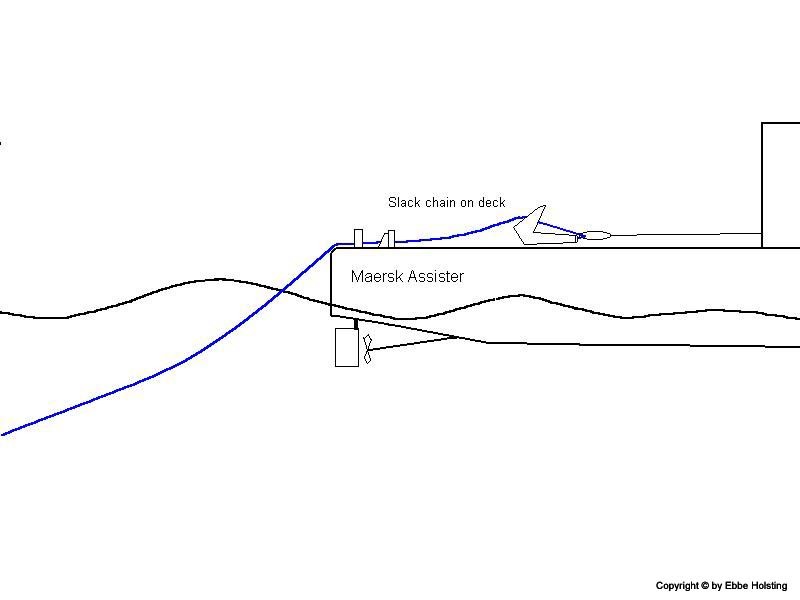 Depending on what the assignment is the anchor can now be disconnected from its anchor chain and the supply vessel's work wire connected to the chain instead. Then the oil rig can be towed by the anchor chain. The anchor can also remain connected to the wire and the vessel will then sail back to the oil rig whilst the rig heaves in the anchor chain. When back at the rig the vessel lowers the anchor back out over the stern whereby the oil rig can pull the anchor onto its "bolster" where it is stowed when the rig is not moored. The chaser wire can then be disconnected from the work wire and the lose eye of the chaser wire lifted back onboard the oil rig. There are several other possibilties depending on the type of work being performed, and this guide is just an example of how a mooring anchor can be retreived from the seabed.